Pension annuities are still the most common way to receive an income in retirement. We provide all our customers with free no obligation quotes from all providers and a comprehensive information pack that tells them everything they need to know. We back this up with excellent customer service which means over 80% of our customers score us 10 out of 10. 'The service could not have been more prompt or more efficient. Constant email communication made it a pleasurable experience, I always felt my needs were being addressed. Of all the providers Best Pension Annuity responded first and got the best deal of all quotes and providers. Many thanks'. Pension Annuity - What is it ? This is the most common way to take your pension. A standard pension annuity will give you a guaranteed income for the rest of your life. Most people use a pension plan to save for their retirement while they are still working. At the time they come to retire the pension fund is taken and after any tax free cash is paid, the rest of the fund is used to purchase an annuity. Because government rules dictate that you have to buy an annuity (or alternative retirement product) these products are also know as Compulsory Purchase Annuities'. Your entire pension fund is exchanged in return for a tax free lump sum and an income for life, known as an annuity. One of the biggest mistakes people make, is that they think they have to take the annuity that is offered by their existing pension provider - they don't ! Your existing pension provider will give you a quote, but you are entitled to shop around for the best deal. In fact this activity is encouraged, it is called 'The Open Market Option'. This can result in a significant increase in your income. This income impacts on the rest of your life ... Shop Around !! There are many features to an annuity, all of which will impact on the monthly income you will receive. While taking an annuity with no additional features and simply asking for the highest income possible may be in your best interests, should you die after only receiving the income for a short period, it will nevertheless completely stop. Any spouse or family you leave behind will get nothing. For this reason many people decide to include other features in their annuity such as a spouses annuity and / or a guarantee period. While these features will reduce the income you will get, many customers don't consider the reductions to be too restrictive and consider them a price worth paying. Additional additions to annuities include level or index linked benefit, a pension for your partner, a guaranteed period, paid in advance or arrears, as well as a number of other features. Full details appear at the bottom of the page. Once you have decided on the features you want, you need to make sure all the annuity providers quote on exactly the same basis. Comparing a quote from one provider which includes a 5 year guarantee with one from another that included a 33% spouse pension is effectively meaningless. We need to identify the highest paying annuity provider who is quoting on the basis you require. This is where we can help. We will get all the quotes you need with as many variations as you need, until you get the best annuity for you. Get Help NOW ! Some customers can very easily get bogged down with dozens of quotes from various providers on all kinds of differing basis. Finding the right one can be as much a guess as anything else. While we will help you identify both the highest quoting annuity provider, and the basis on which you want to take the annuity, we do it in an easy to understand step by step basis. Providing you with real time quotes from providers, we can give you the information that will quickly let you decide what features you will want from your annuity. Once clear on the annuity bias we will then get whole of market quotes for you on the basis you require. From this you will be clearly able to identify the annuity provider offering you the highest income. In essence we simplify what can be a very confusing and time consuming process. We provide you with quotes and an information only pack that helps you focus on the features of an annuity that are important to you. These quotes and pack are entirely FREE and there is no obligation on you to do business with us. We want our customers to make fully informed decisions about a very important aspect of their financial planning. We provide free brochures and guides, and of course this website. We do all the work in collating the various quotes required, from all the UK annuity providers. We will also check with you to ensure you do not qualify for an enhanced annuity which would pay you more than a conventional annuity. We then present all our findings to you in an easy to understand report. This means your time is spent on making the important decisions and not a managing a vast array of paper. Become an expert in the UK pensions and annuities market. Our guide is written in clear english and explains in easy to understand terms the issues you need to consider. Get your guide now, if you are retiring now, or the near future or just interested in taking Tax Free Cash. This is the most common way for people to take an income in retirement. During their working life many people save towards their retirement by using a personal pension as a saving plan. When they come to retire, they sell the pension fund to a company in exchange for a monthly income for life. This is called an Annuity. You do not have to take the annuity you are offered by your existing pension provider, in fact you may be offered more income from an alternative provider. It is therefore essential that you shop around before accepting the annuity offered by your current provider. Many people however can get confused about how their plan works and are unaware that the pension may be more flexible than they realise. The pension can only be taken when they reach either the state retirement age (typically 65), or the retirement age indicated in the pension contract. When they take an income from their pension, they have to take the income offered by their current provider. That they have to buy an annuity at all, they could if they wish do nothing or take an alternative product that allowed them to take just their 25% tax free pension lump sum and an annuity later. Most pensions can be taken as early as age 55 or as late as age 75. Your needs may determine at what point between these two ages it is worth taking your pension. It may be that you need more income before you completely retire, therefore taking your pension early may be an option. Obviously the monthly income paid will be lower, the earlier you take your pension. Our opinion is that you should only take income from your pension early if it is essential to your needs. It may be the case that when you reach your selected retirement age, you have sufficient income from other sources. You could therefore decide to take your pension at a later age, as the monthly income will increase the older you are when you take your pension. In the case above, you may want to protect your fund value by moving it into a cash or deposit fund. This should protect you from any downturns in the investment market. You may also want to just take your Tax Free Cash and leave the rest invested for later. See our Tax Free Cash only section. The Financial Services Authority (FSA) has criticised some pension providers for not making it sufficiently clear to customers that they have the right to shop around for the best annuity. The FSA’s own assessment is that shopping around for your annuity could increase the monthly income you receive by as much as 30%. Of course you need to ensure that when you are comparing quotes from various providers, the quotes are all on the same basis. While a quote that offers £550 per month may appear to be better than one that offers £500, you may change your mind when you learn that the annuity offering £500 will increase with inflation and pay your spouse a pension when you die. There are many features you can add or take away from an Annuity. These will all impact upon the monthly income offered. We will discuss these features later in the section entitled "What you need to decide". The important thing to remember with a standard Pension Annuity is that the monthly income is guaranteed for life. Unless you select an investment backed annuity then the basis of the monthly income will not change and your income will continue to be paid, even if you live to a ripe old age. Let’s hope you do ! There can be no doubt that exercising your open market option and shopping around for the best pension annuity has to be a sensible and prudent thing to do. However it can be both time consuming and confusing. We will do all this work for you and then present you with the results in a simple easy to understand format. You are not under any obligation whatsoever to take up any of the quotes we present to you, and you will not be charged a fee. We will ensure that all the quotes are on a like for like basis. If a provider quotes on a different basis, it can have a major impact on the figures and you could end up selecting the wrong annuity. While providers are generally efficient, we have known the odd mistake to be made. Our standard annuity service is without advice. We will indicate what provider is offering you the highest annuity as well as show you the quotes from other providers. That way we can demonstrate that we have done our job as promised to you. The quotes you receive will be personalised to you and will be guaranteed for a period of typically 30 – 45 days (depending on the provider). You can ask us to start this process for you by either calling us on 0845 83 87 811 or answering a few simple questions on our Request Quotes page. Upon receiving your instruction, we will ask for your permission to contact your existing pension provider to obtain an annuity quote. We will ask you to give us written authority to speak to your existing pension provider to see if your pension contract has any special conditions which could indicate that it is best for you to stay with your existing provider. Without this written authority, your pension provider will not be able to give us specific information about your pension. We will make you aware of what your existing provider is offering so that you can make an informed decision. We can of course obtain quotes purely based upon the information you provide. In such cases we are sure you understand that we could not be held responsible if you moved away from a pension that offered enhanced rates or guarantees. We will need to get an understanding of the features you require from your annuity, for example: do you want the income to be guaranteed for a period, even if you die; would you like your partner to continue to get a pension if they should outlive you; and so on. Obtaining this information from you should not take more than a few minutes. You are of course welcome to call us as often as you like, in fact many of our customers enjoy phoning us as they know we will make time for them and ensure all their questions are answered. Even if you don’t call us, we will keep you informed during every step of the process and keep you regularly updated. You have a number of things to consider, the most important of which is “do I need to take an annuity now?” Remember doing nothing is a real option and may be the best one for you. It is also worth remembering that the decision you make now will be irreversible once you have made it, and it is likely to have a financial impact on you for many years to come. There are a number of features that you may want to include within your annuity. It should be remembered that as you add features to your annuity, the amount paid in monthly income is likely to go down, but you may consider some features too important to leave out. It is possible for an annuity provider to agree to either give you the same income for the remainder of your life, known as level payments, or for the monthly income to increase each year in line with a specified percentage, or an index such as the Retail Price Index (RPI). The benefit of an index linked annuity is that as the monthly payment will increase each year, either by a fixed percentage, or an index such as the retail price index (RPI). It is hoped, but not guaranteed, that these annual increases are roughly in line with inflation. If this objective is achieved then the purchasing power of your annuity should be more or less the same, several years after you have taken your annuity. While this is an attractive option, the initial monthly payment for an index linked annuity will be significantly lower than the payment offered for a level annuity. In our experience, it can take up to 10 years before the monthly payment from an index linked annuity catches up with the payment offered from a level annuity. Again, It can take a further 8 -9 years before the increase in annuity payments makes up for the income lost in the first 10 years. This means that on pure monetary terms it can take on average 18 years before the decision to take and index linked annuity becomes financially viable. in our experience, this results in more people selecting a level annuity. You can request that in the event of your death, your annuity provider continues to make a monthly payment to any surviving spouse or partner. In most cases, the amount paid to a surviving partner tends to be about half the amount paid to the original annuitant. Unless the pension fund is particularly low, most couples tend to choose this option. You can select 100% for your partner if you wish. If your pension fund contains a “protected rights” element, then the part of the annuity that relates to the protected rights amount, will automatically include a spouses pension. See Below. Annuities offer you an income for life in exchange for your pension fund. So if your pension fund is worth £100,000 and you die 3 months after taking your first payment, will the annuity provider keep the rest of the money? If you choose not to have a guaranteed period or spouses pension, then the answer is yes. It is possible to choose a guarantee period, which is typically 5 or 10 years. Most providers offer these year guarantees. The guarantee will ensure that if you die during the guarantee period, the pension will continue to be paid in full until the guarantee period expires. After this point it will either stop, or if a spouse's pension has been selected, it will pay out at a lower level as described above. The vast majority of people choose to have their payments in arrears. This tends to be a simpler option which can also result in a slightly higher payment. Payment in advance could be beneficial for people taking their annuity payments quarterly or annually. Most people tend not to worry too much about these options. This option only applies to annuities paid in arrears. If you choose the "With Proportion" option, this means that if you die midway through a payment period (most people do!! ), then rather than pay the estate nothing, the estate will receive payment for the proportion of the payment period that the annuitant was still alive. To keep it simple; if an annuity paid in arrears pays £1000 per month and the annuitant dies exactly half way through the payment period, the estate will receive £500. If the "Without Proportion" option is selected, then either nothing or the spouse's pension would be paid. This is intended to be used where a spouse’s pension is selected. The intention of "Overlap" is to pay an immediate spouse's pension, on top of any pension payable as part of a guaranteed period. For example, an annuity is taken for £1000 per month with a 5 year guarantee. The annuitant dies after 2 years. The guarantee period will ensure that £1000 per month is paid for the remaining 3 years, and from year 6 onwards £500 per month goes to the surviving partner. If the Overlap option is selected, then the spouse's pension also becomes immediately payable. This means that for the remaining 3 years of the guarantee period £1,500 per month will be paid. At the end of the guarantee period, the payment will reduce to £500 (the original partner’s pension). Please remember that each additional feature you choose to add to your annuity will decrease the amount you receive as a monthly payment. 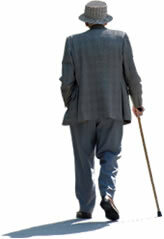 In April 2012 the government cancelled "Protected Rights' options on pension. This means that even if part of your existing pension plan includes protected rights funds, you do not have to adhere to the previous protected rights rules when taking an income from this element from your pension. In very simple terms you don't have to worry about protected rights anymore, however for those of you who are interested the section below explains what this element of your pension used to mean. People in employment (but not the self employed) will have some of their National Insurance contributions directed into something known as the Second State Pension (previously known as SERPS). It was possible to have those National Insurance contributions diverted from the Second State Pension into a private pension. This was known as “Contracting Out”. Any contracted out payments sitting within a personal pension plan were known as protected rights. As these amounts were intended to replace some benefits offered by the State, the government applied some conditions about how this element of the pension was taken. Protected Rights annuities had to offer a 50% spouse’s pension and a 5 year guarantee. Since pension rules changed in April 2006, people who had contracted out could also take 25% of their protected rights fund as a tax free lump sum. If they remain within the state system, the whole amount is used to provide income. While your pension plan may still show some of your fund as being "protected rights" now you can use it just like an ordinary pension plan. You can chose any range of benefits that best suit you.